One look at the trailer of this film and it’s immediately apparent it's out there. On the outset it appears to be a bizarre mixture of "Cast Away" and "Weekend At Bernie’s." Yet once things get going it becomes it’s own thing with no clear inspiration, or perhaps too many inspirations to narrow it down to one or two. It utilizes some potty humor to welcome viewers in a light-hearted manner as if to say, “see we’re an indie drama but we’re not taking ourselves too seriously.” Yet the way it goes about it, complete with copious amounts of corpse farts, had viewers walking out on it at Sundance earlier this year. It’s a strange film that mixes low brow bodily humor with high brow drama that seeks to analyze what it means to be human. Hank (Paul Dano) begins the film alone on an unknown beach with a noose around his neck. He hums a song to himself as he prepares to end his own life. However a quick scan of the beach reveals a dead body that had washed ashore. He investigates the body hoping for signs of life. The only signs he finds is the occasional fart, but it’s enough to keep him from killing himself. The dead body belongs to Manny (Daniel Radcliffe). We never know who or what he is. Is he a figment of Hank’s malnourished imagination? Is he whimsical piece of unexplainable magic that exists to save people on the verge of suicide? The film never makes it explicitly clear how much is real or imagined, but at some point it doesn’t really matter. The journey they go on is what’s important. The title refers to the fact that Manny has everything Hank needs to survive in the wilderness. When Hank is thirsty a press on Manny’s stomach causes fresh water to come out of Manny’s mouth. If he needs to travel across water, Manny’s gas propels them forward like a jet ski. Alternatively, his gas can also be used to start a fire after catching a spark from rubbing Many’s hands together. If he needs to cut through wood, Manny’s arm can spring forward like an axe to cut it. If Hank puts things in Manny’s mouth he can fire them like a weapon. And of course Hank finds practical uses for all of these random abilities. Along the way, the two discuss everything about life, love and what it means to be human including the less glamorous aspects like pooping and masturbation. Furthermore, because Manny seems to be an undead newborn of sorts, Hank has to answer his nonstop questions about everything he’s seeing and hearing. When Hank isn’t answering Manny’s childish questions he’s building playsets that resemble houses and buses in order to articulate what human life is like in civilization for Manny’s curious mind. In some ways these sets feel inspired by the films of Michel Gondry with their practical effects and creative use of random pieces of junk and other household items that may have washed up on the beach. The questions Manny poses to Hank in turn causes him to reevaluate the human experience he was on the verge of quitting. It’s actually quite charming to see the lengths at which Hank is willing to go to in order to provide the human experience for Manny. That is of course if it weren’t for the fact that it’s clearly born out of a selfish desire to get Manny to navigate Hank to safety. It’s about the only thing in this film that comes across as typical of the genre. We’ve seen other romances (or in this case bromances) in which a relationship is built on what started as selfish motives by one member of the relationship. 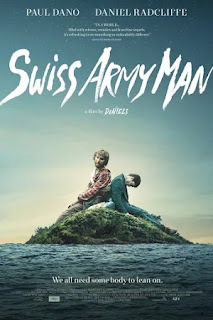 Films like “Ten Things I Hate About You” or even “Avatar” come to mind, but “Swiss Army Man” does so many different things that most viewers might not even notice this familiar trope. The aesthetic with its wilderness setting, attractive cinematography, and its indie soundtrack by Andy Hull and Robert McDowell (of Manchester Orchestra) is frequently reminiscent of Spike Jonze’s “Where the Wild Things Are.” The soundtrack is no Karen O, but it remains satisfying throughout nonetheless. As borderline nondescript as the term “dreamlike” is becoming, this is one of the films more fitting of the description. The soundtrack and the way it frequently interacts with the characters on screen is just one example of the dreamlike nature of the film. It often ventures into speedy montages as one or both of the characters start singing or humming with what becomes the soundtrack of the film itself. As such there are times when, in a bit of genre breaking, this film begins to feel like a musical. The performances by both Paul Dano and Daniel Radcliffe work for their honesty and their earnestness. For material that could have become completely unwatchable in lesser artist’s hands, Dano and Radcliffe make it work. Granted the longer it goes on the more clear it is that this concept wasn’t thought out to as ambitious a conclusion as the idea that drove the first half. "Swiss Army Man" will either capture you within the first half or you’ll be like the many who walked out on it at Sundance. It’s as likely to be described as the most unique film of the year as it is the weirdest, or even possibly the worst. Nevertheless I appreciated how unique it was. The Daniels (directing team Dan Kwan and Daniel Scheinert) remained so dedicated to their vision that they didn't bother explaining themselves. Yet that ends up becoming one of the main points of the film. Humans are weird. We fart, we poop, we do other strange things we don't want other people to hear or see. This is about being human and not needing an explanation for it. It's fitting then that the Daniels don't explain much about this bizarre vision of theirs. Don't get me wrong, it's still undeniably weird, and doesn’t end in a place that puts it all together in a particularly satisfying way, but I suspect it's partly my failing to accept strange human tendencies that compels me to say so. I never felt judged or "called out on" for feeling weird, but it did make me wonder why it feels so embarrassing to be human some times. Perhaps we could all use a little bizarre whimsy in our lives. It’s been some time since I’ve felt as divided about a film as I do about this one. Yet it’s exactly that curious feeling that prompted me to see it in the first place. It is simply too unique to miss. I say that accepting all the good and the bad that comes with it.